We WELCOME all Single Riders, Groups and Clubs! Bike Towels Cleaned Daily for your use. Water hose with bucket and soap to wash down your Bike if needed. After a long Ride there are 18 Restaruants / Pubs within a very easy walk and then back to the rocking chair. Shops and Galleries just out our main Entrance. Google Maps, if you are close, will allow for easy location of our property. 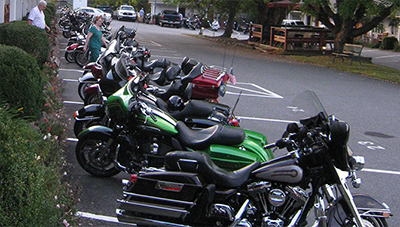 Plan your trip through Blue Ridge Motorcycling.